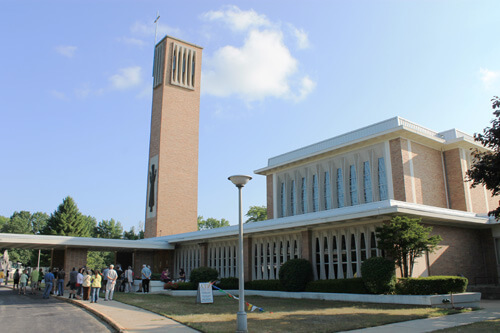 I arrived at the Siena Center exactly five minutes before the doors opened — stumbling toward the waiting crowd as I gawked at the midcentury architecture of the center itself. Before the doors opened, I chatted briefly with Josh, one of the kind employees of ATR Estate Sales, and he told me that that the crowd of 60 people anxiously awaiting entrance into the treasure trove of goodies was rather small for a sale of this magnitude. Josh speculated that the small crowd size was due to the sale opening on a Friday instead of a Saturday. What is the usual crowd for a sale of this size according to Josh? About 500 — Yikes! As I stood waiting my turn to enter, I continued to notice the interesting details of the center itself. 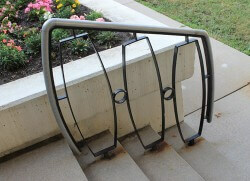 Even the railings on the front steps matched the geometric shapes on the building — in fact — this shape was repeated nearly everywhere throughout the center. The railings, the windows, the pass-through niches in the wall and likely through the rest of the building. 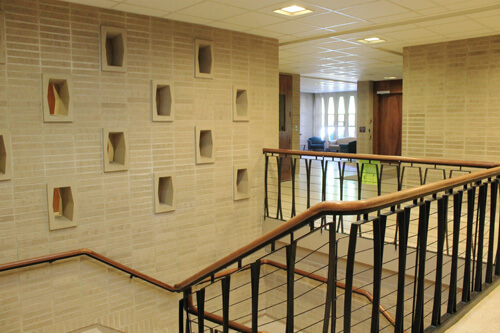 Above: Entryway and stairwell to lower auditorium, Siena Center, Racine, WI. Then it was time to enter the sale itself. 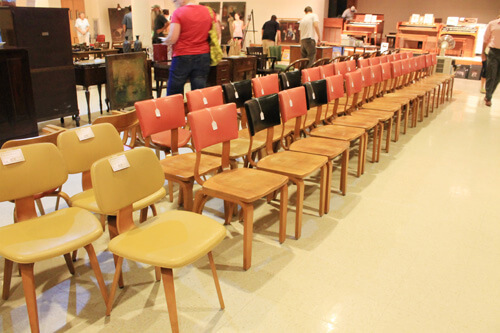 By the time I got into the auditorium (person number 58 of 60), many of the advertised midcentury pieces were sold already! 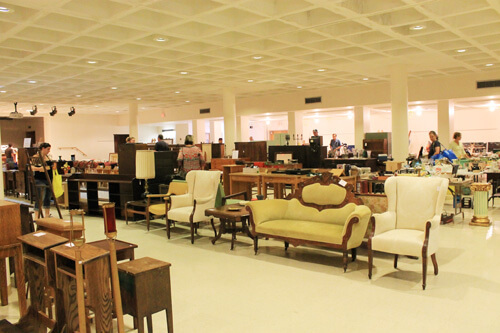 Above: Siena Center auditorium packed with stuff during hundreds-of-years-of-treasures estate sale. 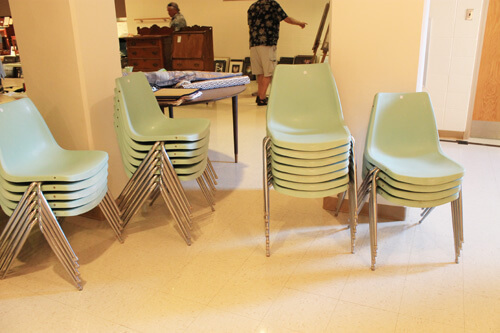 Above: I didn’t even get to see what they were asking for these turquoise Thonet chairs, they were already sold and being carried off as I entered the auditorium. 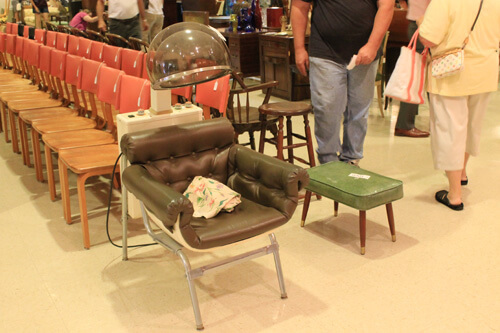 Above: Retro salon chair – sold, retro green foot stool – sold. Above: Thonet Chairs for miles! 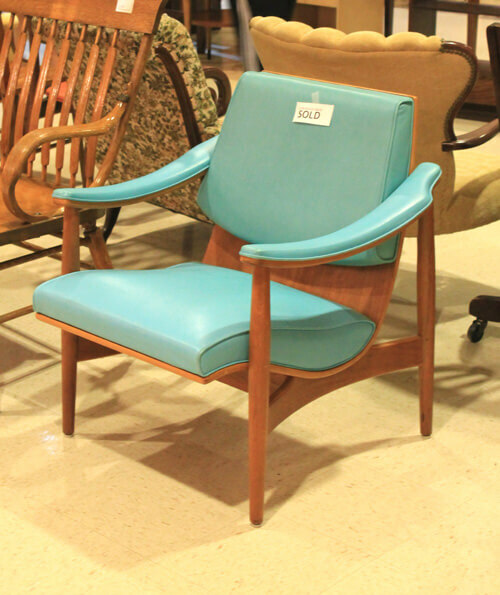 Above: This particular style of Thonet chair had Pam and me both drooling just a little bit. By the time I made it over to look at these chairs, one guy had claimed all of the ones with green cushions. I thought about bringing one home with me, but they were $80-$140 each depending on condition, and I really didn’t have a spot to put one, so I passed. Above: I found it quite interesting that there were light and dark wood versions of the same chair. 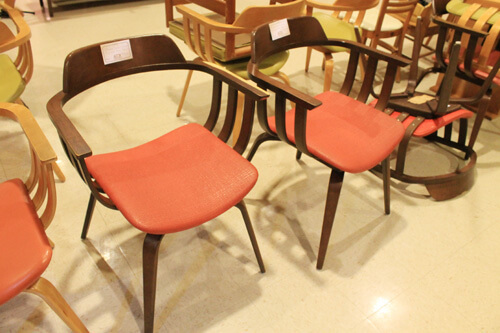 As I walked the aisles of furniture, I noticed that most of the items that had sold right away when the doors opened were midcentury furniture pieces — many of the Thonet chairs, the salon chair, retro footstools — it seems that retro pieces were a big draw for this particular crowd. As time passed though, I noticed people filling up their arms with all sorts of treasures. 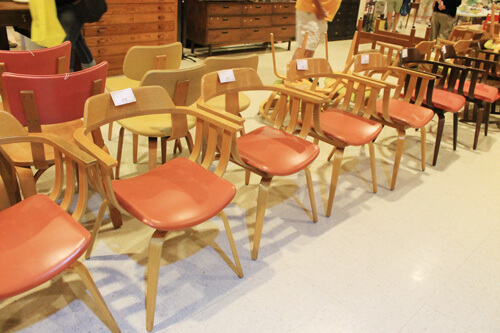 The majority of the items at this sale were furniture pieces, though there were quite a few retro smalls hanging around. 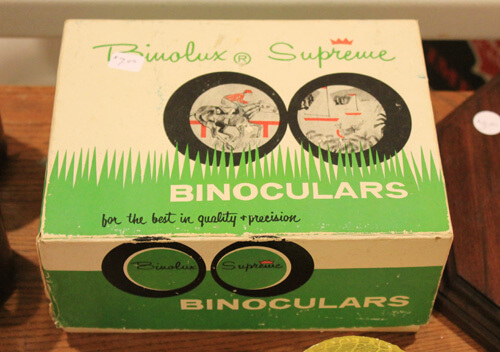 Above: Retro binoculars. I love the packaging! 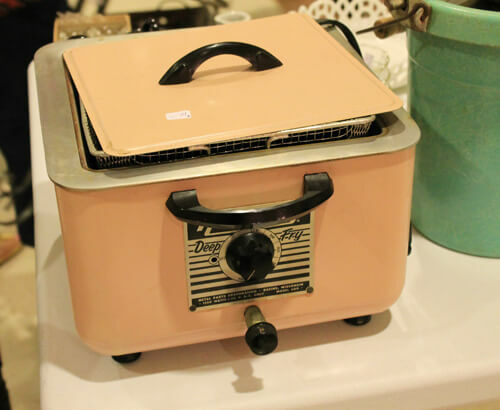 Above: A retro pink deep fryer…every girl’s dream? 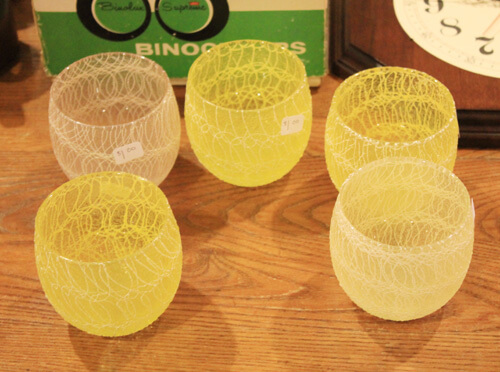 Above: There were plenty of cool midcentury glasses and small dishes to be had. Above: I’m not sure what these are exactly, but they sure do look neat. Anyone have any ideas? 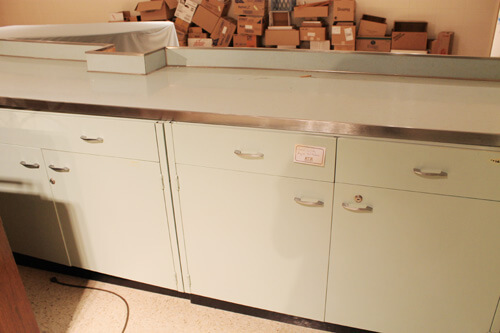 I made my way to the back of the auditorium, where these St. Charles aqua cabinets were hiding. I counted 15 upper cabinets, 10 lower door cabinets and 6 drawers overall. 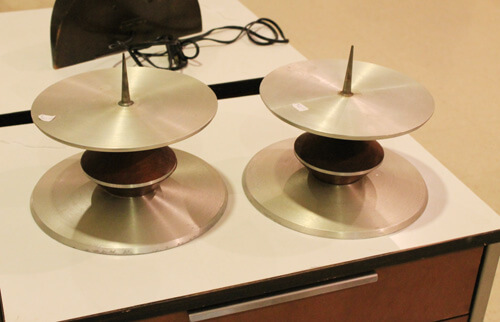 They were priced at $1,500, but were taking bids. When I left the sale, they hadn’t yet sold. They were a lovely shade of aqua and in pretty good condition overall. 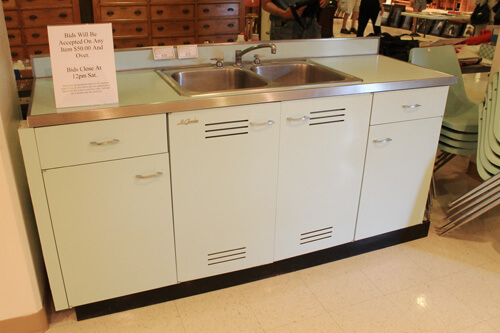 Unfortunately, the countertop on the second half of the lower cabinets had a bumped out piece, which might make it harder to use the original laminate counters — which were a lovely matching aqua with little gold flecks. 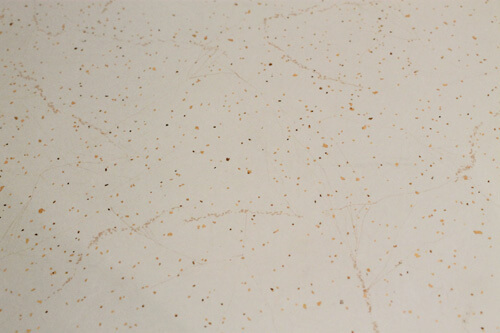 Above: Laminate countertops on St. Charles kitchen cabinets. 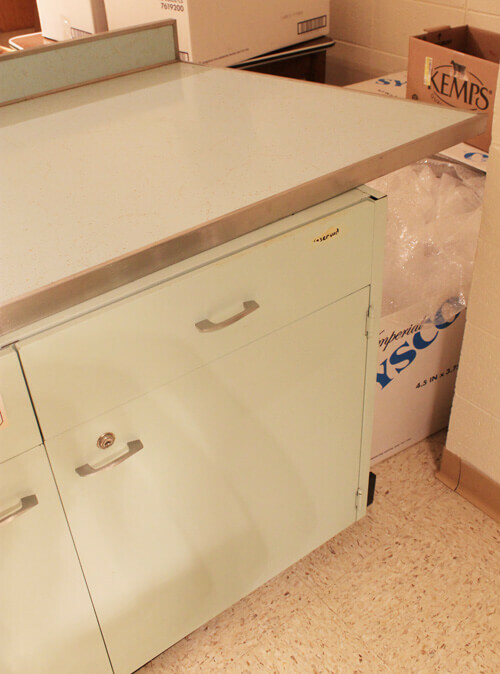 Above: The end of the laminate countertops on this section of cabinets came to a sharp angle. 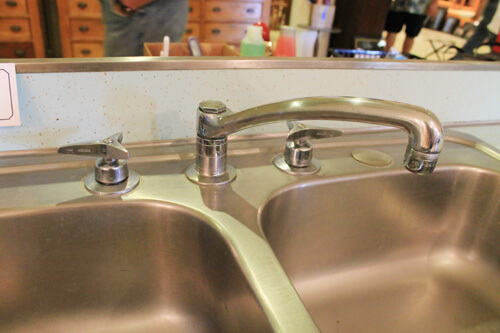 Above: My favorite part of the kitchen set were the handles on the sink. 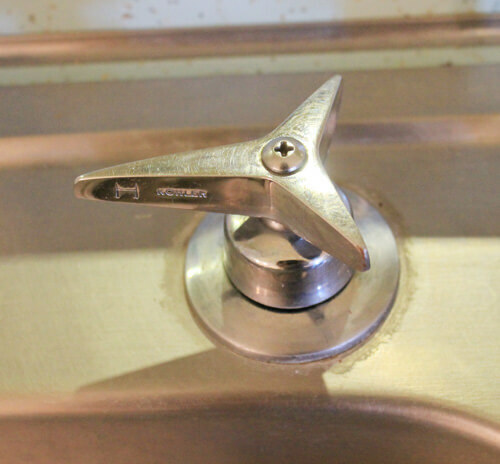 Above: Retro Kohler sink handle. Above: These aqua plastic chairs matched the St. Charles kitchen cabinets perfectly! 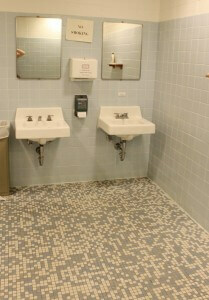 Above: Siena Center Ladies room waiting area. On my way out, I stopped into the ladies room briefly to investigate. 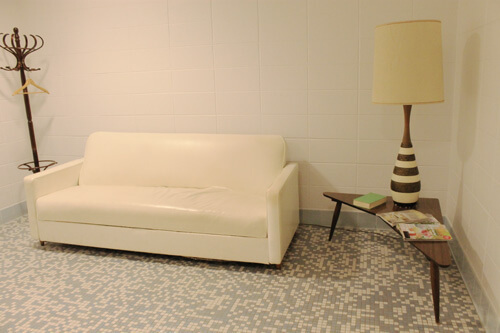 Surely I should see if it was as retro as the rest of the building — and sure enough, a kidney shaped table, huge retro lamp and tons of blue tiles awaited me. Surprisingly, I left the sale only with the photos on my camera — but of course I was tempted more than a few times to bring something home. On the way out I asked a few of the Siena Center Security guards (which I suspect were the sisters themselves) if they knew what year the center was built. After some deliberation, they agreed that it was likely built in 1962 — same year as my retro ranch house! No wonder I liked the building so much! 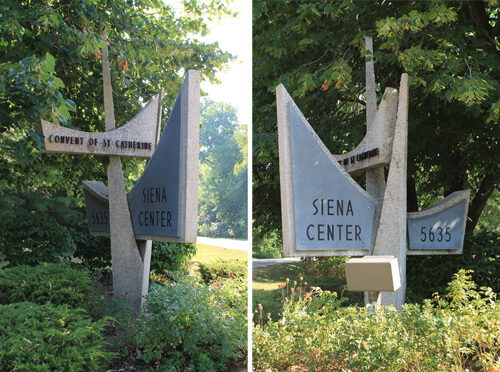 My favorite detail of all was the sign at the very end of the long drive that leads to the Siena Center. It can be viewed from several angles and reads as both a sculpture and a sign. Too bad they didn’t have a spare one to sell me. I would have loved to use it as garden art! 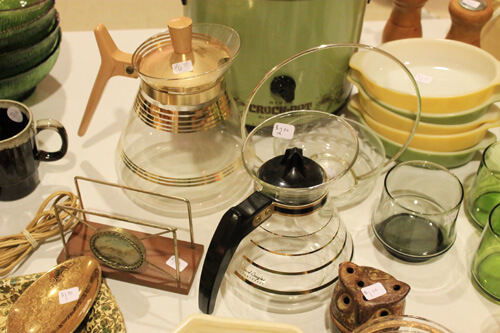 Did you attend the sale at the Siena Center? What treasures did you bring home? I have those Kohler handles on the sink in our half bath. I love them too! We have a 1958 ranch. Thank you for taking photo’s of your visit. I would have loved to have been there!